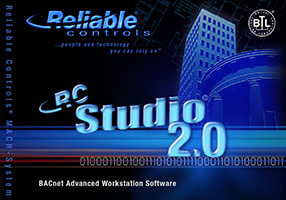 Reliable Controls is proud to announce the release of RC-Studio® 2.0 - the ultimate BACnet® operator workstation software for the Reliable Controls MACH-System™. Featuring a new BACnet® discovery browser, automated network save and a broad range of Flash animated graphics. RC-Studio® 2.0 allows building owners and managers the freedom to not only think outside of the box, but to fully control the box.